Newcourt Barton Farmhouse accommodation is set in a delightful location, just 10 minutes from J28 M5. 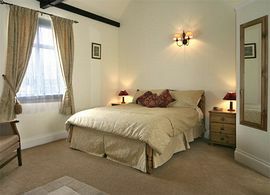 We provide ensuite double, twin and family rooms, with spectacular views from the windows. The tastefully colour co-ordinated rooms include TVs with digital box receivers, electronic safe, hot drink making facilities, hairdryer and towels. Wireless broadband is available for any guests who may have Wi-Fi laptops. Guests have their own separate entrance with access to rooms at all times. There is ample safe parking to the side of the property. A comfortable guests lounge is available with TV, Videos, Books, Games, Puzzles and Piano. Our delicious home cooked Breakfasts are served in the spacious dining room overlooking the garden and surrounding countryside. 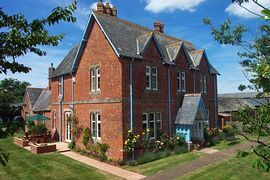 Newcourt Barton is a convenient overnight stop or ideal touring base to explore the delights Devon has to offer. Moors, coast, Exeter, National Trust properties all within easy access. Coarse fishing on site - free to guests staying. &pund;30.00 - £40.00 per person per night.